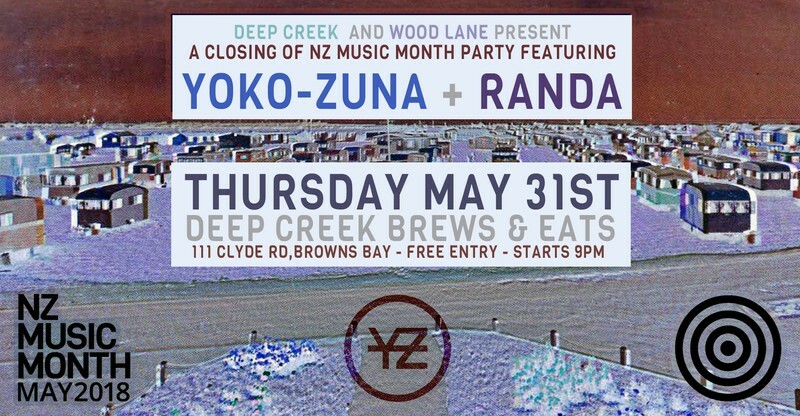 Come hang while we take NZ Music Month out with a bang, with Yoko-Zuna and Randa courtesy of Deep Creek Brews and Eats. With the release of their debut album, This Place Here, in 2015, Yoko-Zuna announced themselves to the greater music scene with an album showcasing a sound which hasn’t been previously seen in NZ – sub-electronic frequencies, melodic moments, and immense bass-synth-fuelled drops. The album combined Yoko-Zuna’s unique instrumental sound with some of the country’s most talented vocalists including David Dallas, Bailey Wiley, Melodownz and Team Dynamite, and in turn created a huge queue of willing collaborators. Not willing to rest on their laurels, May 2016 saw Yoko-Zuna release the Luminols EP, 5 tracks which not only continues to fulfil the promise of their amazing live shows, but also show new depth and versatility to the band’s song-writing abilities. Featuring some of NZ’s biggest vocalists in P-Digsss (Shapeshifter), Laughton Kora and Tom Scott (HomeBrew, @peace), along with the fresh talents of Lukan Rai$ey, HEAVY and Randa, the EP shows a band infusing the genres of electronic/hip-hop with their own inimitable sound. 2017 saw the band roll all across New Zealand including performances at Rhythm and Vines, Northern Bass, Splore, Soundsplash and Homegrown festivals and debuting at Australia's Big Sound Festival in Brisbane. Yoko-Zuna are set to release their up-coming second album in early 2018. Featuring collaborations with a concoction of new artists including, P-Money, Raiza Biza & Miloux. Mainard Larkin (Randa) is a rapper, performer and oddball based in Auckland, New Zealand. After graduating high school and realising they had no friends, Larkin began writing bedroom projects under the name Randa. Whether rhyming about favourite home cooked dishes, Neopets or navigating life as a non-binary trans person, they’ve been winning over hearts ever since the drop of debut EP, ‘Summer Camp’. Recent releases include songs such as ‘Angel Boy’ and the house influenced tribute to good style, ‘Fashion’ which recently hit 100K streams on Spotify. Opening for international artists such as Grimes and Le1f, Larkin’s live performance has proved to be an exciting and authentically captivating extension of an infectious online music persona.